One of the big challenges when using manure as a fertilizer source is knowing the amount of plant nutrients that are present and available in the manure. This uncertainty increases the risk of over-applying or under-applying nutrients to the field. The risk is greatest with nitrogen (N), which can easily move out of manure during storage and is a source of drinking water concerns. However, there are ways that producers can lower that risk. One of those ways is by getting manure tested. Studies from Minnesota and elsewhere have shown how important it is to get manure tested rather than relying on published book nutrient values. Book values suggest a specific nitrogen credit for specific manure types. 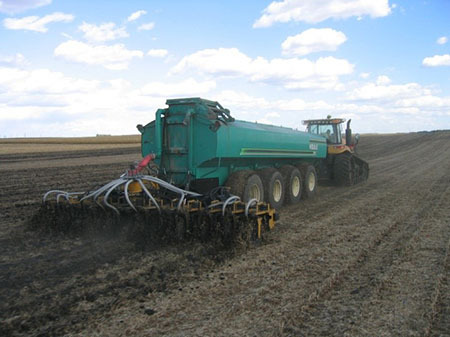 They are useful for planning where to spread your manure, but can lead to over- or under-application of nutrients if used as the basis for actual application rates. Manure nitrogen content is highly variable. Consider the case of liquid dairy manure, which has book values of 31 or 32 lbs N/1,000 gallons in Minnesota. Different studies on lab-tested dairy manure have found that individual manure N contents are typically anywhere from 20-40 percent higher or lower than these book values. With a book value of 32 lbs N/1,000 gallons, the nitrogen in your dairy manure could be anywhere from 19.2 to 44.8 lbs/1,000 gallons. That creates quite a risk of over- or under-applying nitrogen! Agitating and testing manure reduces that variability. While there is still variability in the results you get when you test manure, it is lower than relying on book values. Studies suggest 10 to 30 percent for unmixed manure, but as low as three to seven percent for well-mixed or agitated manure. That means if you have 24 lbs N/1,000 gallons in your manure and it has been agitated and analyzed, you could reasonably expect the measured results to be from 22.3 to 25.7 lbs/1,000 gallons. Much better than the 19.2 to 44.8 lbs/1000 gallons range you could expect without testing. While dairy manure is the example used here, these trends are true of other manure sources as well. Just by mixing and analyzing your manure, the risk of over- or under-applying nitrogen goes down immensely. If you can’t agitate your manure, try to take a number of subsamples from across the manure stockpile and mix them. Studies show that 15 to 25 subsamples will get the variation below 10 percent. For manure with an actual nitrogen concentration of 24 lbs N/ton, this would mean the N content reported by the lab would likely be 21.6 to 26.4 lbs/ton. Many soil scientists in the Midwest have noted that when nitrogen application rates are less than 25 pounds above or below the best rate for a field, it usually has a negligible effect on yields and profitability, regardless of form. That means that you don’t need to hit a magical number that is best for your field, you just want to get within 25 pounds of that number. Testing manure will minimize how much uncertainty there is in manure N concentrations and help you hit that goal.